Vegan Eats and Treats! : Anniversary Grilled Veggie Sandwiches! Such a wonderful time of year! I love MoFo soooo much and I look forward to meeting new bloggers, discovering new blogs, and reading posts from my favorite bloggers who I already know and love. I also really love Instagram, so I'm stoked to see new posts and new folks mofo-in' on Instagram. This year, after various deliberations, I have decided to take the plunge into the unknown abyss of a themeless-MoFo!! Gasp! Usually I am such a diligent blogger, coming up with themes and doing work in advance and all that... but this year, I just couldn't do it. Something in my spirit longed to be set free, into the vast open space of themelessness. So, here we go! Today is Mr. VE&T and my second wedding anniversary. 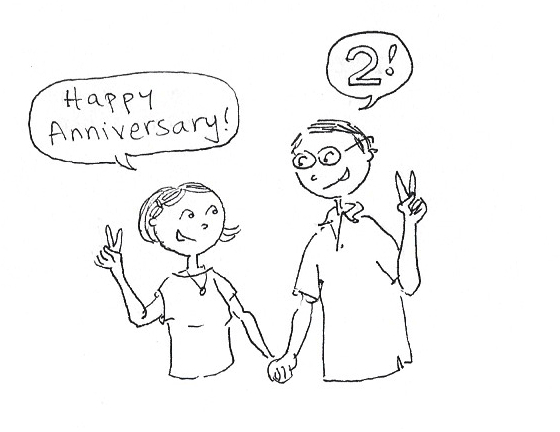 In actuality, we have been together for almost 15 years, so celebrating "2 years" seems a little silly. But fun. And why skip out on another opportunity to celebrate our love for each other? So, we mostly just spent the afternoon together - and are planning to go out to a nice dinner together this evening. 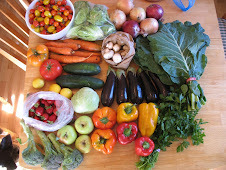 beautiful, summery, colorful veggie goodness! But, for lunch I decided to make something special. One of my MoFo ambitions is to push myself to experiment in the kitchen more often, and not be so dependent on cookbooks. I pretty much only ever cook straight from cookbooks, and I'm envious of my free-wheelin' friends who improvise and are creative in the kitchen. So, I came up with this idea of making Grilled Veggie & Tofu Ricotta "Sandwiches." 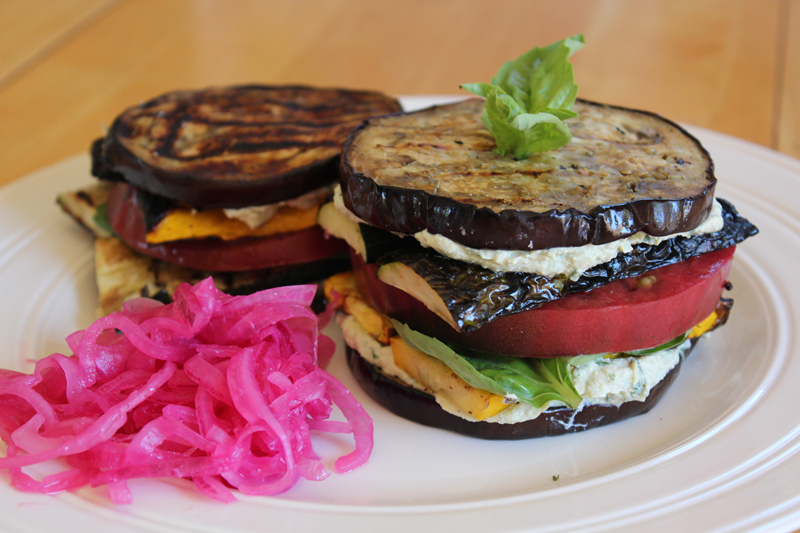 There are two big grilled eggplant "patties," filled with lots of tofu ricotta (with blended in fresh basil leaves), grilled yellow summer squash and green zucchini, fresh basil leaves, and a giant slice of heirloom tomato. Since we are hungry beasts, I made us two each, and we had no problem putting them away! I also included a big mountain of the marinated red onions from Terry Hope's new book, Salad Samurai. I am currently very in love with those onions and that book. That book alone is one reason I couldn't commit to a whole month of recipe-less-ness! two years! we made it! May we all be victorious in our posting and reading goals! Happy Anniversary! Happy Mofo! This is my first year posting (not reading). I'm really looking forward to seeing what my favorite bloggers come up with and finding new blogs to read also! yay! good luck with your first ever MoFo! It's so fun - and don't get discouraged if you miss a day or two! Those onions. I haven't gotten that book yet but have seen so many good things from it. Oh Panda, that book is amazing. Actually, I am working on a post reviewing about 5-6 of the salads we've tried so far. We are loving that book so much. Oh, also! Dynise at Urban Vegan is doing a giveaway to win a copy! Happy Anniversary!!!! Those look so good -- I'm going to have to try them! I think they'd be great with some vegan basil pesto, too! yeah, they would be great with Pesto! unfortunately for me, my otherwise great fella doesn't like pesto much, so I didn't bother. But I think it would be great! Happy 15 plus two! I think you should definitely improvise more in the kitchen if you come up with results like the sandwiches. I think they look great! Thanks for the moral support Andrea! I feel like I'll just make italiany or mexi stuff the whole time, but I'm gonna see what emerges! A themeless mofo?! OMG, Amey, I never thought I'd see it! Your grilled veggie sandwich looks amazing & I'm hoping to take some inspiration from you winging it - I'm a total cookbook grrl too! And Happy Anniversary, you two are awesome and adorable and yay for celebrating love as often as possible! I know, can you believe it? What has the world come to? I love your cute drawings! What a great 'sandwich', it looks so fresh and juicy. Whoo! Join me in Themelessland! It can be scary and exciting and beautiful and disappointing but mostly exciting and beautiful! I keep telling myself no more cookbooks, because I so rarely use them, but people everywhere--like, veteran vegans--seem to be legitimately freaking out over Terry's. May have to do it. And happy (sort of 2nd) anniversary! Yum & Happy Anniversary! 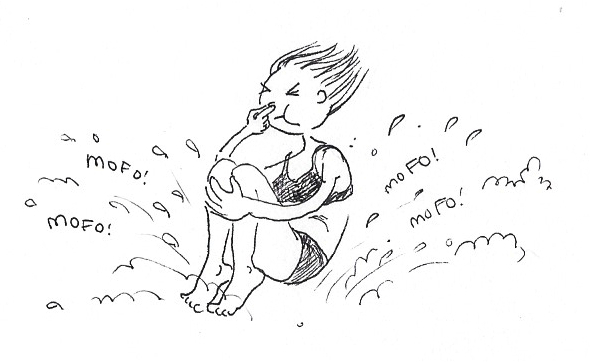 I'm so excited to read all the 'mofo posts this year! aww happy anniversary! that is one ace looking sammie! Happy anniversary. What a gorgeous looking lunch. I keep seeing great things about Salad Samuri. I must order a copy! Happy anniversary! Looks really great! Those stacks look beautiful and delicious. Also, happy anniversary! Happy Mofo! And happy anniversary!! Good luck with themelessness. That's typically my route every year. Ha! I just can't commit. But this is my first mofo with a theme. We'll see if I can stick to it. Ha! Those sammies look delicious!